Make happy memories to last a lifetime as you vacation in this, two bedroom, two bath with bunkroom condo which sleeps six comfortably. This luxurious condo, on the twelfth floor, is the perfect place to relax to the sound of the waves as you enjoy the spectacular sunsets from your spacious balcony. 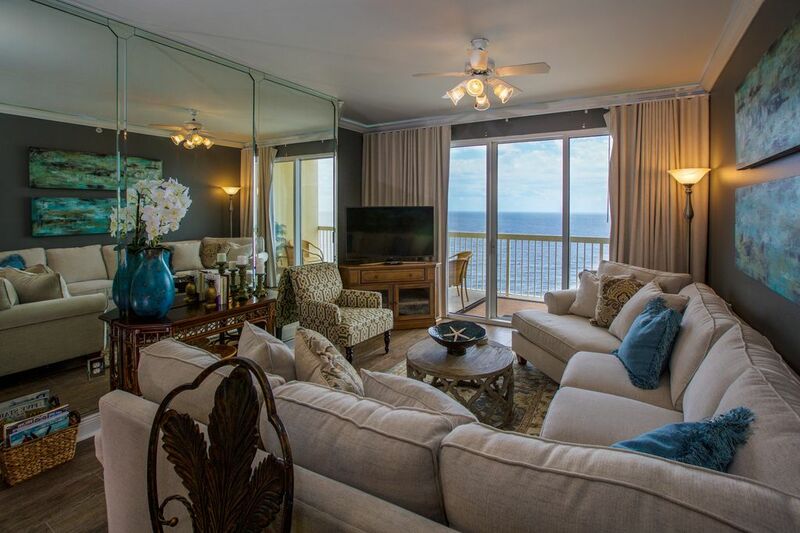 This professionally decorated condo is located in the less congested more desirable West End of Panama City Beach on Front Beach Road, just 1-1/2 miles from Pier Park. This home away from home has all the upgrades you could possibly hope for. Stainless steel appliances, nine foot ceilings, and whirlpool garden tub, just to mention a few. For those who want the closeness to experience all Panama City Beach has to offer, yet the amenities on the premises to have the perfect vacation and all the fun, without leaving the complex. Stay in our condo and spend your day playing tennis, swimming in the gulf or beach side pool and spa with large deck, enjoying the fitness room or taking a leisure walk through the lush tropical landscaping. Everything is here for you to have your best vacation. We hope you will enjoy our condominium and have many happy memories when you return home. We know this is a place you will want to return year after year. No Pets. No Smoking. We do not rent to anyone under 25 years old, 3 night minimum. 4 story parking garage across the road from the main condo building. there is a covered, elevated walkway from the garage to the condo building. Fitness Room has several types of fitness equipment. There is enough toilet paper, paper towels, soap and shampoo to last 2 - 3 days. There are 3 elevators in the condo building and 1 in the garage building. There are flat screen TV's, and DVD players in both bedrooms and the bunk room. Pool table in the Game Room. 2 pools on site, 1 beach side and 1 across the road by garage, hot tubs by each pool. The condo is beautiful and well stocked with everything for a great stay. It was incredibly clean when we arrived and has been well taken care of. Great location!! We have rented previously and have always had a great experience. Our July/August 2018 vacation we spent plenty of time in the condo due to rain. The condo has been remodeled, completely updated and so user friendly. It's stocked with plenty of bath towels, kitchen items, spacious pantry (w/baskets to organize snacks etc. ), beach items and full size washer/dryer. Definitely will book next year!!! Our overall experience was wonderful. The condo itself was fantastic, clean, spacious, and well equipped for a short or long vacation. Had several issues with wifi, but they got us going and it doesnt take away from rating of condo at all. Would love for property to have heated pool that was beachside, not just the one across the road. But it was a wonderful place to stay, and the owner was great to work with on everything. Gorgeous views and beautiful condo! The condo was beautifully decorated and was well stocked. They even included dish soap and dishwashing detergent. It included top of the line appliances and comfortable beds. The owner is very easy to deal with. The complex pools are nice and everything is very clean. My visit included the beach chair rentals which saved me $150. I hope to book this unit again when I return to Panama City. Perfect condo on the beach! Since there are no pets allowed with the exception of service dogs, there are pet boarding businesses in the area.